The reality-enhancing technology Virtual Reality is making rounds across the business world lately. Businesses looking to move toward a digital, consolidated ecosystem are experimenting with the latest tech to find new ways to work. The expected returns on investment are simple: improved efficiency, integrated processes, productive employees, and reduced cost. From automobiles to hospitality and from healthcare to manufacturing, every industry is trying to boost marketing and sales efforts through virtual reality. Let’s find what’s happening within businesses spaces, courtesy VR. Virtual Reality allows you to look around a place without having to move an inch. It is the use of computer technology to create a simulated environment. Users are immersed inside an experience and able to interact with 3D worlds. Vision, hearing, touch, sometimes even smell is transformed into this artificial world. Travel and tourism companies are leveraging the technology to help their customers visualize their trip to far-off lands. Fashion companies are helping customers try on outfits without having to actually wear them. Organisations are helping new candidates take a look and feel of their working environment before getting onboard. Need to attend a conference or a business meetup in another country? Maybe you can participate virtually and slash down the travel expenditure. 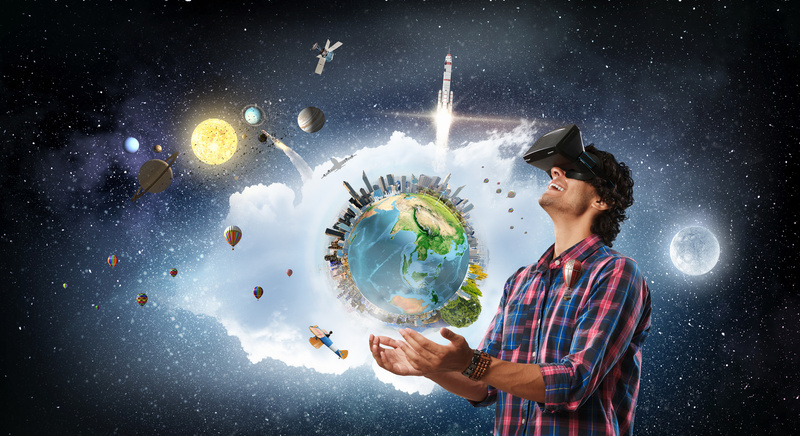 Allowing employees to participate in international conferences and meetings virtually through VR can help organisations improve work productivity and digitize training and learning. A VR business can impart a near-real experience to employees, enabling them to bask in training knowledge while reading off the trainer’s body language and expressions. Businesses are facing cut-throat competition from their rivals these days. Consequently, the hiring process has become more of a two-way exchange. While candidates need to qualify certain criteria, businesses need to attract the best talent to apply for open positions. Through virtual reality applications, organisations are enabling employees to get an immersive experience of their work environment, so they get a better understanding of the work culture. Case in point: Jet.com, the Walmart owned shopping portal is using its collaborative company culture to attract top talent with VR, creating a “show, don’t tell” experience. Using these experiences can massively impact the quality of candidates that reach out to you. And, only those who feel in-tune with your values will apply. Yay! Let’s face it- online 2D interviews have lost their charm amid all the lack of network connection, missing sentences, and repeating points- the strive to communicate. And, that is VR interviews. Hiring managers can now get a feel of a candidate’s personality and achieve a near in-person interview experience with them. Virtual reality applications can place candidates right into the room with you, allowing you to derive insights from their gestures and expressions, just like you would in a face-to-face interview. This allows a high success rate for culture fit with minimum costs and no travel overhead. When an interviewer has to learn more about a candidate’s skills, they can test them in a better way with VR. Recruiters can set up a hypothetical challenge for their candidate and closely analyze how they react to the problem and perform it. Recruiters can watch as the candidate listens to the challenge, approaches it for the solution, manages stress, and so on- things that usually determine whether or not a candidate is a right fit for any organization. Well, it sure doesn’t to Jaguar. The company has joined forces with the enigmatic band Gorillaz to fill in more than a thousand software engineering and electronics roles. They launched a free mixed-reality app in both leading play stores: iTunes and Google Play. Candidates can learn the nuances of electric vehicles and play demanding and challenging code puzzles. These puzzles test candidates’ persistence, curiosity, problem-solving skills, and lateral thinking. Jaguar is leveraging two benefits from this unique hiring approach. Candidates who enjoy the games and are impressed by Jaguar’s continuous innovation and work environment would undoubtedly apply to open positions through traditional methods. Second, those who perform exceptionally well at the puzzles can be tracked down and attracted to open jobs. Employer branding is an area of interest and investment for the competitive businesses of today. Thus, it makes sense for companies to enhance the experience for potential employees who can help take their brands to the next level. Want more insights about hot trends in recruitment? Check out more from LynxPro. At LynxPro, we help companies hire the talent they need and deserve. Alternatively, we position candidates in the best light to their ability and help them land fulfilling and challenging jobs they can impart expertise to. If you are either, look us up here.